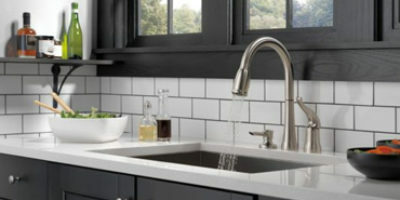 Another company that makes amazing kitchen faucets is Moen. 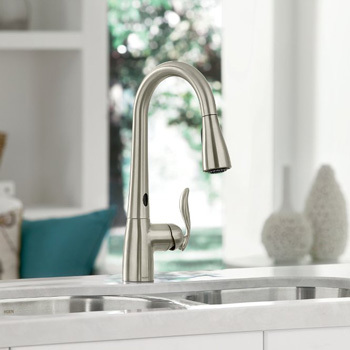 The Arbor Motionsense model from Moen is a beautiful and very practical faucet that will look perfect in your kitchen. 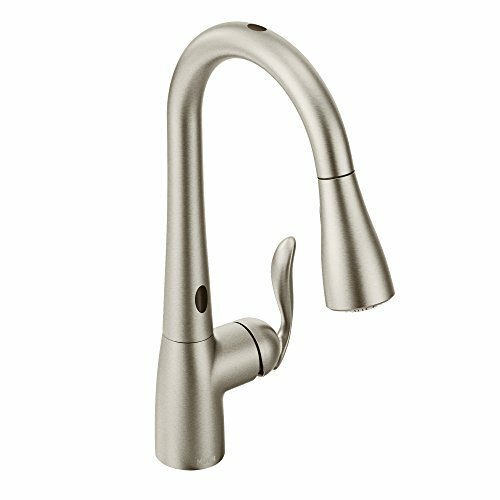 Probably the most important part of the Moet Arbor Motionsense faucet is the multiple choice for activating it. The user can activate it in three different ways and both with and without touching it. There are two sensors placed on the spout. One at the very top of the arc that can be activated with a simple wave of your hand over it, and one under it, near the handle, that is excellent if you want the sensor to detect your movement right when you get your hands under the spout and you’re ready to use it right away. The third option is to use to use the handle for turning the faucet on and off. The handle moves in different directions whether you need to turn the water on or off, adjust the temperature, or adjust the flow. The high arc on this model really means high. It is 15.5 inches from the place it is mounted to the highest point of the arc. This allows the user the best possible experience while using it. Along with it, comes the hose installed on the end of the spout. Unlike other models, this one has an unusually long hose. It is 68-inches long and the spray wand is ergonomic and easy to use. The best part of it is that it gets back into position very easy and docks to the spout perfectly and without a problem thanks to the special Reflex system that is installed. The spray head has a special button that allows you to stop the water flow if needed. This is excellent for situations when you need to use the hose out of the sink. Moen Arbor Motionsense uses 6 AA batteries. Of course, if the batteries get exhausted, you can always turn it on using the handle so you don’t have to worry about technology failing you at some point. However, the real deal is when the batteries work, so you can use the sensors that are very convenient. After you activate them, water flows in less than half a second. 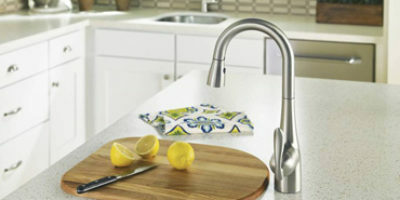 Another great feature is the Power Clean spray technology that this faucet is using. This allows 50% more spray power than the rest of the competition. Made from brass, the Moen Arbor Motionsense will fit perfectly in the kitchen. The high arc with a pull-down style looks great on every sink and will certainly be of great help for its users and it will add a lot of glam to the place. The elegance it offers can fit without a problem to all kitchen styles because it is modern yet still adjustable to all other types of interiors. The one-hole mount looks very classy but it can still be mounted with classic three holes. Being made of brass doesn’t mean it looks like an old tin can. The design is perfect and the color is fine silver that looks simply amazing. It has a modern look and the sensors on top and on the bottom are just adding the futuristic look to it. The handle and hose are made to look as cool as the rest of the faucet. The handle is placed on the bottom of it and follows the same style as the spout. At the very end of the spout, you can barely see that there’s a hose ready to come out of it and it’s amazingly 68-inches long. The hose follows the same style and the same color as the spout. After using it, the smart Reflex system helps it get back to its place smoothly and perfectly accurate. Then it looks again like it’s one whole piece.